So a hundred dollars later and small game of web-phone-word.of.mouth-tag the problem with the Brother’s presser feet, is now in the process of being fixed (or at least slowed down). As it may have been mentioned before the presser feet collection for this machine (the Brother DB2-B791-015) have come from an older Singer 600WI, which is a standard drop feed – straight stitch industrial sewing machine. Therefor the presser feet are not slotted for the motion of the needle feed style mechanism that the Brother uses. The everyday foot (of a needle feed machine) has a longer slot and a wider opening to allow the needle to pass through on it’s down motion, while it is pulling the fabric back (this foot was ordered from a company in Hopkinsville, Kentucky by the name of Dunlap Sunbrand). Some of the old feet had been customized by using a Dremel tool, which can also be done by leaving your old presser feet with a good sewing shop that you trust. However, after grinding down a bunch of material from two of the cheaper feet that the Brother uses, it was clear that although it may get the job done, it is time consuming and slightly, well, maybe, mmm, too inaccurate, for industry quality taste and expectations. This of course brings up the issue of the right tool for the job, which should always be taken advantage of when you can. Thus introducing the milling machine. It was obvious that in order to have the feet correctly modified it would take the expertise of a machinist and their milling machine to precisely cut through the feet from the underside and then widen and elongate the slot for the needle to pass through. 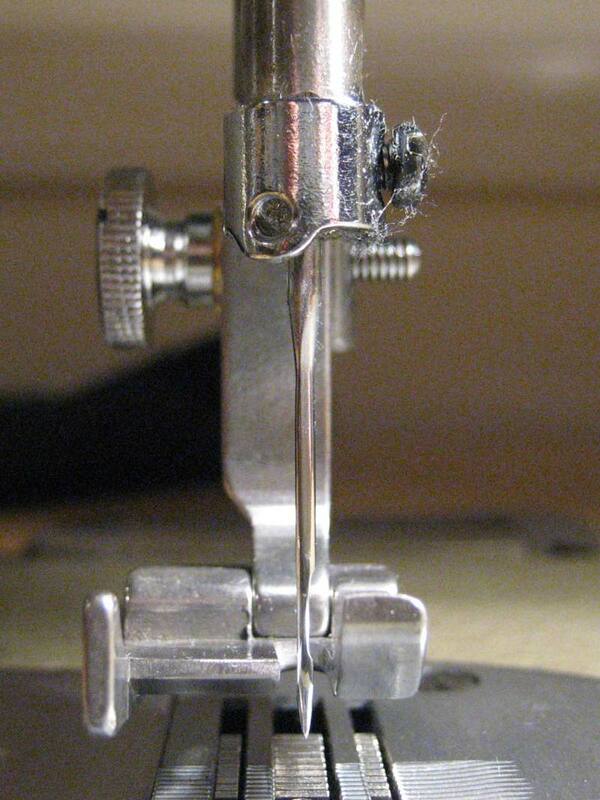 Some of the concerns were that the cut would have to be, A) in the correct spot (obviously) in relationship not to the usual “hole” that a presser foot has for the needle to rise and fall through, but in relationship to where the presser foot is mounted to the needle bar, this is because, as close as each foot is to the next in terms of needle to foot, each one is slightly different due to human error, so it is of most importance to consider where the needle bar and receiving end of the presser foot meet because this is going to be the most consistent juncture. 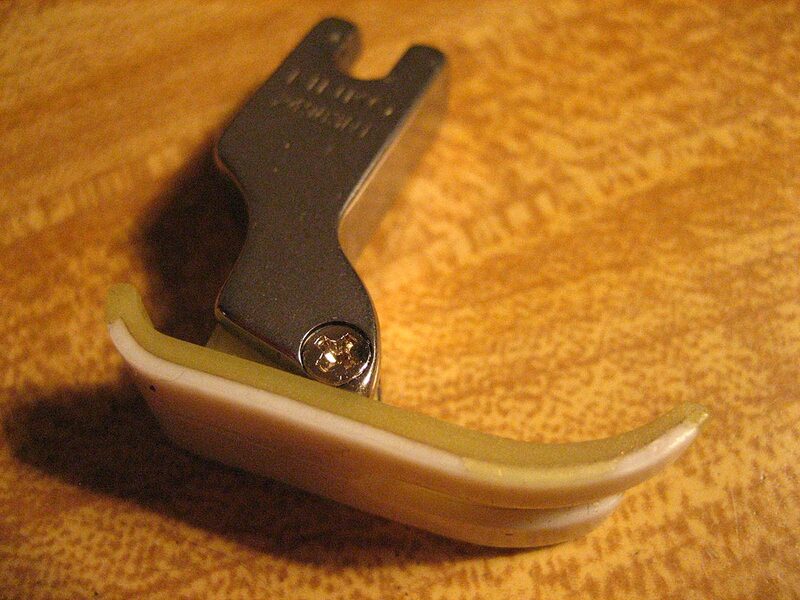 Next, B) that it was of the correct dimensions, of course this too is fairly obvious, but the interesting thing is that on the Brother, it consistently places the needle towards the right-inside of the presser foot opening. So no matter how wide the gap is, for somereasont he right side is always too close, the problem of that leads into section C. Here is the largest concern of the customization of the feet, C) in sewing we must consider the materials that are being used, in this particular sense it would primarily consist of cotton, polyester, and nylon, and then any combination of those three and beyond (rayon, silk, wool, vinyl, hemp, leather, solar sheeting, etc. etc. ), with the largest issue being abrasion. For sewing – abrasion may be the biggest antibody that exsists. Every time you run a stitch or seam the thread is passed through numerous holes and entry ways, not to mention the fabric which it is mending together. For the Brother and it’s feet the big C has to deal with the fact that the cuts or millwork has to leave it with no burs. It is extremely important that when all is said and done at the end of the day, that the presser feet are completely smooth in any area where the thread or material may come into contact with them. In some tests of the feet which were retro-fitted with the Dremel tool, the thread would sometimes split sue to microscopic burs int he edge of the foot where the thread was rubbing everytime it passed up and down. This is very important, in all areas of the machine, the needle plate, the presser feet, the needles, the bed of the machine, the table which holds all of this, must be as smooth and free of burs, splinters, or anything else that may catch the materials and cause a tear. Just think about things being smooo-th and you should be alright. With the right people and the right tools, all of the cuts should be very very easy to smooth out, unlike the many different ridges and vertexes that result from the Dremel tool bit (which is not always the case, but the right tool for the job won in this situation). 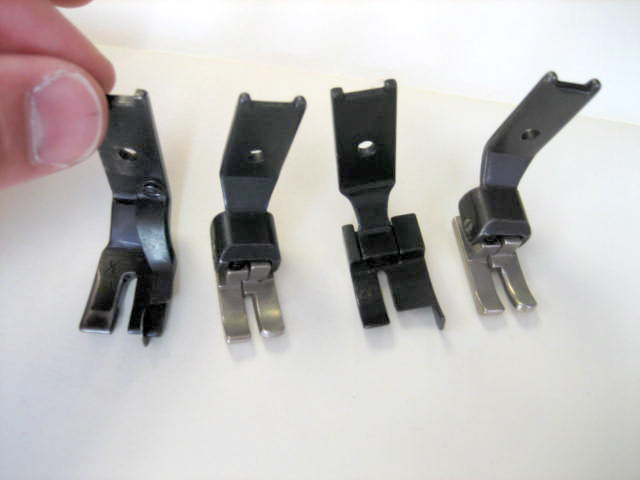 …here are two images of four presser feet for a Singer 111 model needle feed machine (that were found at Eddy Sewing Machine in Los Angeles). Unfortunately they have a different way of syncing up to the machines needle bar, so they are of no use to the Brother DB2-B791-015. 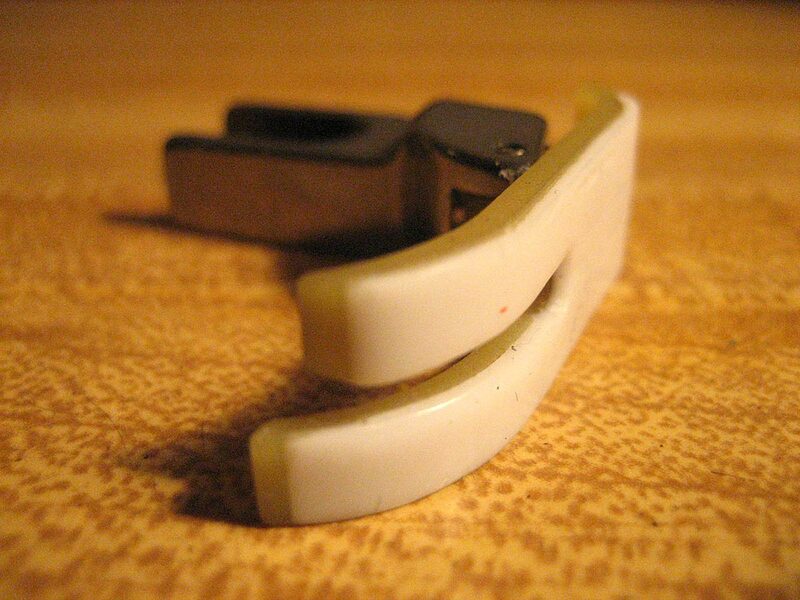 But they give a clear example of the exaggerated cuts and wider stance that the slot for a needle feed machine presser foot needs. 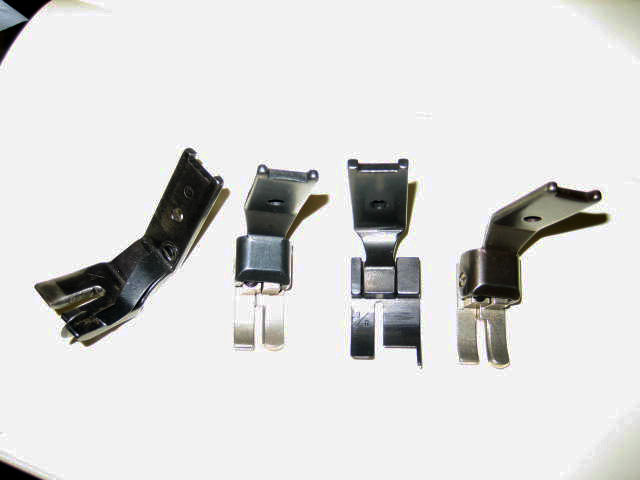 From the left, number 1and 3 are the best example, number 2 and 4 are probably just like Linko 211 and 212 presser feet – for the inside radius of a jean pocket. Thumbnail number 1 shows how much material has been extracted from the foot. The line is the best approximation of how wide and how long the foot’s slot used to be. By grinding the slot out in the direction of the arrows, it was possible to open it up enough to make proper room for the needle to pass. Thumbnails 2 & 3 are good illustrations of how much extra room was needed around the needle. 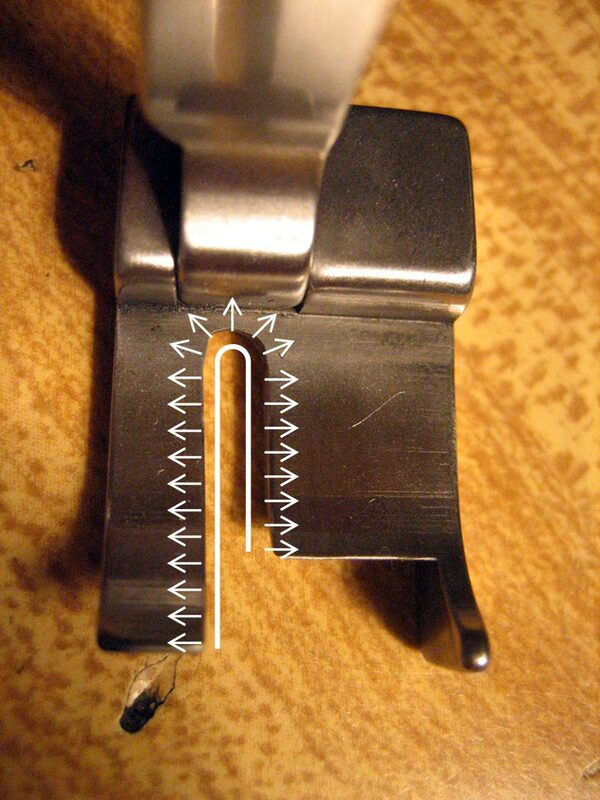 As you can see – the needle is now fairly well centered within the slot of the foot. This is also a good picture to see the elongated hole in the feed-dog, which is below the throat-plate. With the Dremel at hand working on the presser feet, it seemed reasonable to smooth out the edges of that elongated hole (essentially rounding the edges off). In this image it is still how it came from the factory, but with a little bit of work, the hole is much smoother around the edges now. 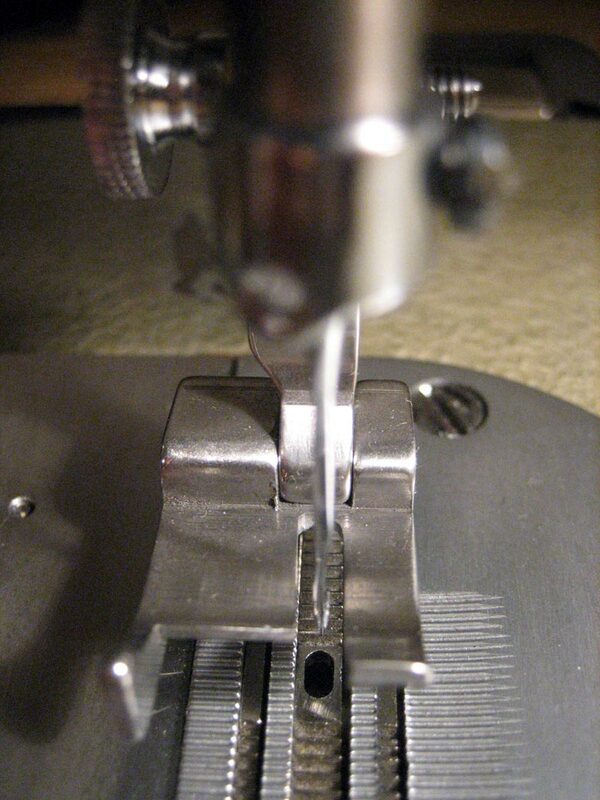 There is a noticeable difference in the thread’s movement through the hole when sewing and pulling excess thread for trimming. 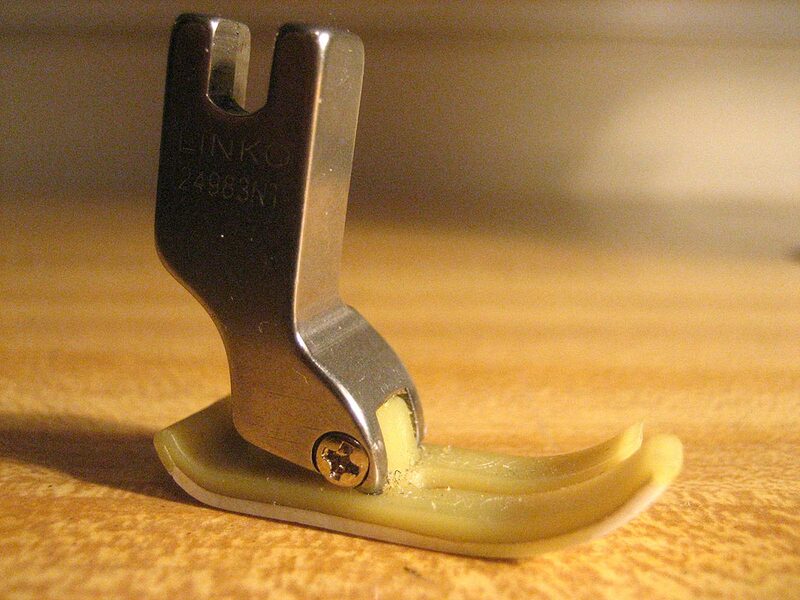 Although this may not be necessary – it is a very good trick to help your machine sew more consistent stitches. 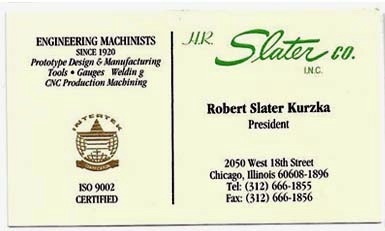 The header image is a left handed 1/16″ hemming foot. This one has been ground all the way down to the gate itself – this was necessary as the narrow slot does not allow much room for finesse in such a situation. However, these two feet (the right and left hand 1/16″ hemmers) were the easiest to be consistent with because the gate was the end point of what needed to be ground out so seeing where to stop was simplified. Ideally, the slot would not have been ground so far back towards the hinge of the foot, but sometimes human error takes over.